My car unfortunately or fortunately had to go in for service. Fortunately, the valet brought me a new P85+ loaner as the service was likely going to take more than one day. In the end, I had the loaner car for four days. This car has two significant differences between my own car. The “P” part or faster motor and the “+” part for the improved handling. This post will discuss the overall differences between my S85, the P85+, and the Roadster. The second half will discuss other observations driving a different and newer car. 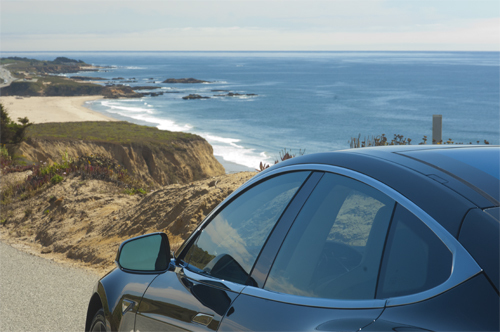 I decided to give my loaner a true test drive and headed over on some very winding roads over to the beach on a truly gorgeous day. I ended up driving on a lot of twisty roads, a fair amount of freeways on subsequent day, and did run some errands in town on another day. The paperwork with the loaner that you sign does say you can’t go over 80mph. With the roads around here being relatively busy at all times during the day, I find it difficult to go that fast but just following traffic at one point I did go 79mph. My first impression driving the car is that for some reason this car is noisier than mine. The noise could be from the tires or the suspension. I would by no means call it “noisy” but my particular car is almost bubble silent. On several occasions, I started from a dead stop to test out the low end acceleration. Yes, definitely faster than my 85 but not nearly as elegant or fast as the Roadster. The front end tips up a bit and the back wheels can slip a bit from a dead start particularly if you are turning. I had a hard time finding places to accelerate on the four drives I took in the loaner car. I am not as crazy with the acceleration on the Performance as I was with the Roadster. The Roadster had no awkward movements out of the gate, just pure complete straight shot. I can’t replicate that exact same feeling with the Performance. But I think I am in some ways comparing roller coasters and everyone has their favorites. Flooring the vanilla 85 is still pretty darn fun and has no awkwardness and saved me money. At least in the area where I live, I find it hard to take full advantage of this kind of acceleration and did not feel compelled to buy a Performance version. I also like having a vehicle that I can floor without any likely jolts, noises or significant tire wear. On the other hand, I love the “+” part of the equation and found it a reasonable price performance improvement for $6,500. I went on some very windy roads that fortunately had very little traffic. The “+” just really grips the road in a way my 85 with 21” wheels does not. I think an interesting option would be to get the “+” without the “P”. On my first long drive on very windy roads, I really enjoyed the “+”. The third drive I was just doing a simple errand. I started to really notice the uneven pavement on the roads I was driving on. I actually missed the smoother ride of my vanilla 85 as the “+” felt rough in a reminiscent way of my Roadster. Four years in driving my Roadster, I never took it on an overnight road trip. Partially because the likely need to think about charging it, but more so because of the non-luxurious ride. Since most of my driving is somewhat ordinary with a fair amount of traffic even during non-commute hours, I would find it quite challenging to find moments to utilize the capabilities of the “+”. Perhaps up to once a month I travel on some twisty roads. In these situations, I would prefer a “+” as it really handles these roads with a nice tight grip. But my vanilla 85 also handles the roads very well. Probably even more important for me is I do enjoy long road trips. I think the overall profile of the vanilla suspension is much smoother and more appropriate for these kinds of trips. So for me personally, I would still purchase the same car configuration if the plus had been available. I am still interested in test driving a vanilla 85 with the new 19” wheels though. A few other small notes on this newer Model S. The valet service left the car in my driveway and I drove it about an hour later. The temperature outside was about 70 degrees. I was surprised how warm the car was already, definitely warmer than my grey car with a black interior. So at least from this small data point, the exterior color seems to influence the warmth of the car more than the interior color. 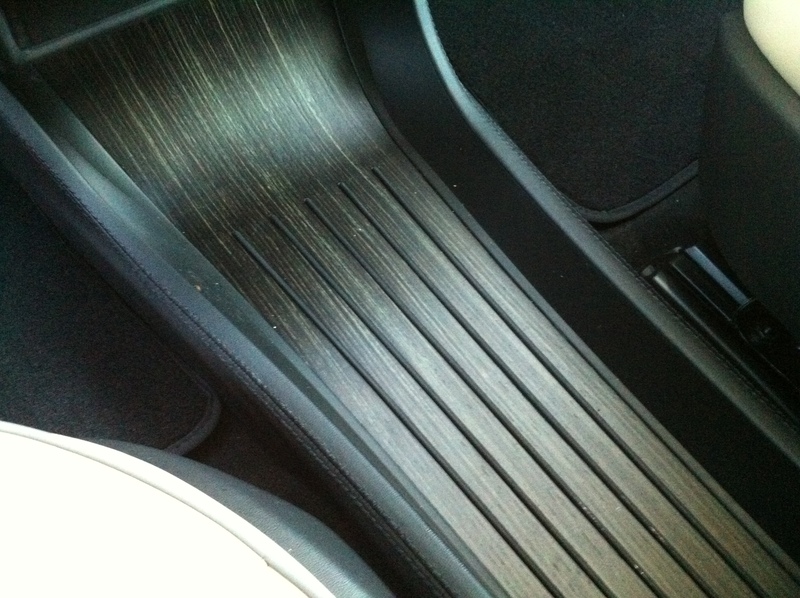 I am still not particularly fond of the high contrast between the tan leather and the black interior elements. I like light interiors but the Model S has far too much black on the doors, on the dash and on the floors to truly be a tan or grey interior option. Whether or not the headliner is Alacantra or not, I really did not notice or care. This car had several new features: the parking sensors and the yacht floor. 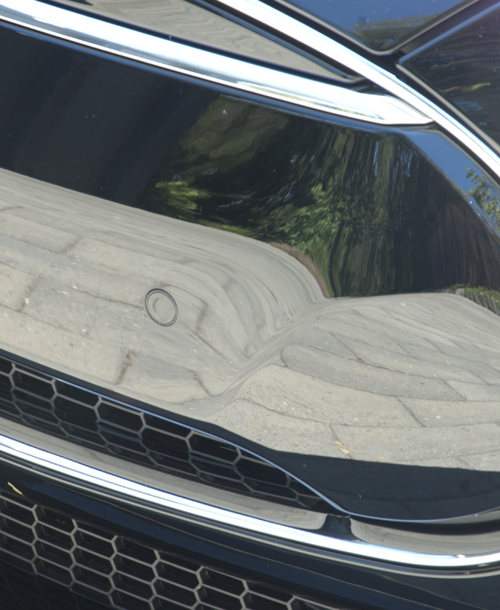 Four little holes are in the cars bumpers for the parking sensors but I don’t think the software is yet available as I did not hear any audible clues nor could I see any dash indicators when pulling out of my driveway. The physical parking sensors are visible but are not obvious. The front bumper also is my least favorite part of the Model S from an aesthetic point of view with or without parking sensors. Yacht Floor Optionaway from sight. 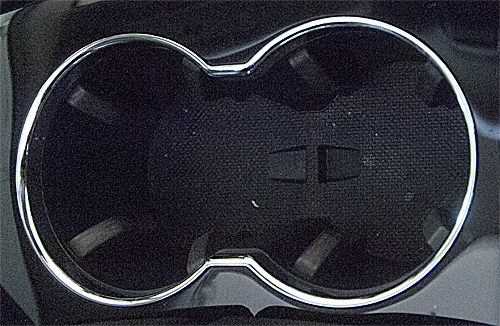 The more obscure change I noticed was the change in cup holder design. I love my cup holders. They work perfectly for reusable containers and reusable coffee cups. They have some nice cinchers that grip the containers. The newer cup holders are the same size but don’t have cinchers! My reusable water bottle was flying all around the loaner car. I had to take it out of the cup holder and leave it on the seat as the noise was quite irritating. Just for fun, I also took detail notes after charging it to a full non-range charge and this car with less than 1,000 miles charged to 237 miles. The previous drivers also had kWh / mile usage of over 370. My number was lower than that as I ended up behind some slow cars on the drive back from the beach and with freeway driving the car is reasonably efficient. A handful of other folks with low VINs have stated that the build quality seemed better on their loaner. I did not notice any difference in my 04xxx car and the 16xxx loaner. I hope this review is helpful for new buyers in choosing between the different 85 versions. I had also wrote this post when the new options were first announced. The earlier post provides a general overview of the different 85 models. My car went in for service again. I have run into Tesla’s Achilles heel. I have had a series of problems with two of my doors. The initial problems were two door handles that were stuck. The door handles would extend but even with a huge amount of pressure, the door simply would not open. The workaround was to open the door from the inside by either entering the car from another door or rolling down the windows through the fob or the app. The car went in for service, and they replaced the offending door handles. A full report is available on this blog post. After the fix of the door handle, the problem re-occured again with slightly different symptoms. The door was never stuck, but would open by itself. This occurred twice in two months and more details are found on this blog post. I tried to contact my local service center. Several times I got busy signals. I called again another day and got sent to voicemail and left a very detailed description. After a week, I had not heard back from Tesla as I reported here. Although my problem was not serious, it did make my car a bit insecure as the door would open when it wanted to, and once in a public location, where I was notified by a friendly person. I happened to be one block away from the service center for completely unrelated business, and decided to talk to the service personnel. I think they were a little surprised to see someone stop in to make an appointment, but it worked and my car was scheduled for a week later. Their backup I think is significantly longer, but my issue could leave the car in an unsafe position. When the day came for the valet service to pick up my car, I had to call Tesla back to inquire about my appointment. I am not completely sure if they somehow misplaced my appointment or one of us wrote down the wrong day for the appointment. Regardless, they sent out their valet service to my house. The valets now come wearing ties. Although this touch is nice, I also liked “the old days” when the valet service was often a mechanic or service advisor. The haunted door was hopefully fixed this time for good. During the service call, they replaced the handle a 3rd time, only to find the door would not open. So they replaced the door handle again! This door is now using its fourth door handle! As the service center folks pointed out, the door handles are clearly their Achilles’ heel. I’m always curious about the origins of myths and expressions and decided to look up the Achilles’ heel. Achilles was a Greek warrior that was dipped into magical waters by his mother. The only part of his body that was not submerged was his heel. He was eventually shot by an arrow into his heel and died. 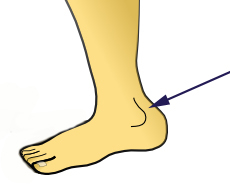 The term Achilles’ heel means weak spot or vulnerability. I think at this point, both the unreliable door handles and the lack of sufficient service staff are both Tesla’s Achilles’ heels. On the Roadster is a nice but not perfect feature: valet mode. Twice I have needed to hand over the keys to my car to a valet – once at a nice restaurant and a second time to a parking lot attendant in a sketchy neighborhood. The valet feature is a log of the valet’s activities. The computer logs the number of miles, the top speed, the number of unlock attempts and the number of trunk openings. While driving in valet mode, I did get up to 75 miles per hour. Rumors exist that Tesla will limit the valet mode top speed to 50 miles per hour in the future. I think the very visible screen is a large deterrent already. Handing the Roadster to the valet is a bit awkward. The Tesla has a little remembered feature that the doors are locked while your key is in the ignition. The attendant is trying to be gracious by opening the car door. But you are busy turning off the car and setting the car in valet mode. The first valet had parked a Tesla before, but the parking lot attendant was a little confused and I needed to explain to him how to get in and out of the car.